BIG congrats to JT who became the youngest inductee of the Memphis Music Hall of Fame on Saturday night! 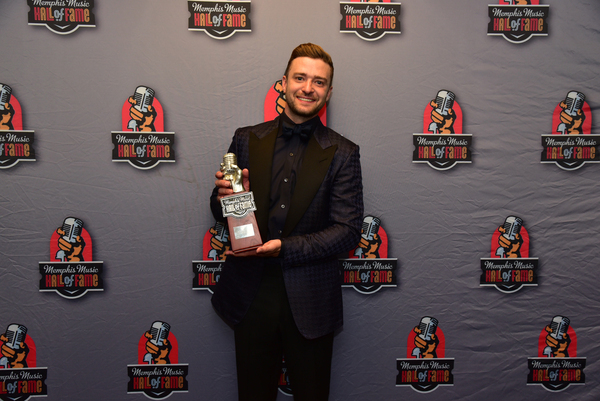 Timberlake's acceptance was introduced by wise words from Grizzlies point guard Mike Conley, Three 6 Mafia founder DJ Paul and Timberlake’s close friend and host of “The Tonight Show,” Jimmy Fallon. "Who better to induct him than me... Mrs. Justin Timberlake," cracked Fallon. "Jessica, I'm sorry; the heart wants what it wants." "What I love about Justin is he's never forgotten where he comes from, " Fallon continued. "He loves Memphis. I mean, his wife's last name is Biel. I talked him out of naming his son Barbecue... He's passionate about his hometown." After shouting out the Grizzlies and celebrating the University of Memphis’ football win over Ole Miss that day (he led the entire audience in a rendition of the school’s fight song), Timberlake noted that “Memphis is the global capital of soul. And that soul is not just in the music, it’s in the people." After thanking his wife and family, Timberlake concluded his speech by saying he owed a deep debt to the city of Memphis. “I only hope I can continue to return the favor for as long as I live and breathe,” he said. Later in the evening, Sam Moore (half of the duo known as “Double Dynamite”) brought JT out of the crowd and onto the stage to sing "Soul Man". Justin then beatboxed while Moore scatted and what was originally a performance turned into a full-on celebration. Joined by Stax greats Cropper and William Bell, the pair closed the show with a rendition of “(Sittin’ On) The Dock of the Bay.” Moore and JT then traded jokes and vocals on the Otis Redding classic, celebrating the love for music that brought them both together that night. He just wins everything ! Congratulation ! !be proud of you! Just wondering - Since seeing you sing the Tiger Fight Song, why don't you come lead The Mighty Sound Of The South (as Alan Cross did after win against Ole Miss) at one of the home games? Would love to see you! Since 2013 I feel like I've been surfing a gargantuan wave of joy and inspiration generated by this man and his : music, dancing, world tour, TV appearances, awards, philanthropy, family and golf game. All become something so much more than expected because of his talent, discipline, work ethic, creativity, dedication to craft, insight, generous heart, genuine soul, personality and sense wicked of humor. He is an undeniable force. I can only dream of what may be on the horizon, but with certainty I say- the best is yet to come! From the bottom of my heart Justin LUV YA & CONGRATULATIONS!!!! Just an amazing, smart, talented,caring,funny jack of all trades that can do it all and each and every time we see him he proves it. I couldn't be more proud of him as part of the JTFAM/TNKID's. I might not have been able to get to your hometown and rep you but I know a few ladies that did and love that they were kind enough to share what they experienced and how deeply they felt seeing him on his big night.